We’ve talked a lot about sending people to Mars, mostly because sending people to Mars would be really, really cool. But we also talk so much about it because a lot of people think that Mars is the next place humans will colonize. After all, with just a little technological help, humans can live on the Martian surface. Sure, we’d need to bring along air and a place to live and we’d need to figure out how to eat, but that’s all pretty doable — at least we think it will be soon. But we have another neighbor, who tends to get ignored in conversations about space colonies: Venus. Venus is usually the closest planet to Earth, and it’s the easiest other planet to get to, so by those measures it might even be a better target than Mars. Plus, people call Venus “Earth’s sister”, which is just really sweet. But people also call Venus “hellish”, and that fire and brimstone is why we don’t talk a lot about colonizing our dear sister planet. Landing people on Venus’s surface and having them live to tell the tale would be a big challenge, much bigger than for Mars. But what if we didn’t need to land on the surface? What if we could have a floating city in the Venusian skies? Well, according to some folks at NASA, the idea isn’t as far-fetched as it sounds. Part of why Venus’s surface is so unfriendly is its temperature. Venus has a runaway greenhouse effect that traps the energy from sunlight, making the temperature at the surface hot enough to melt lead. The atmospheric pressure is also around ninety times what it is here on Earth, and the atmosphere doesn’t even have any oxygen — it’s mostly carbon dioxide and sulfur. All that makes it hard to even send robots to Venus’s surface. On Mars, rovers like Opportunity have lasted for more than a decade. But the most successful mission to land on Venus was Venera 13, which lasted all of two hours and seven minutes before its electronics burned out and started corroding. And even THAT was four times longer than it was expected to last! So, okay, maybe landing people on the surface is a little impractical, but the intense pressures and temperatures down there could actually keep people safe in Venus’s skies. 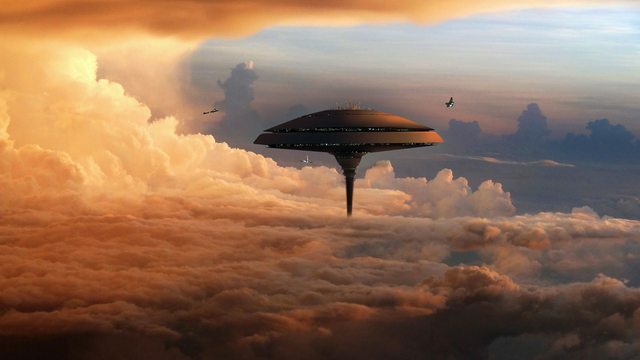 NASA floating a concept to Venus.©Cloud City fan art, via imgur.com. Click to zoom. Here on Earth, you need to fill a balloon with something like helium to make it float in the air. The helium floats because it’s a lot less dense than Earth’s atmosphere is. But Venus has a much denser atmosphere than Earth does. So if you just filled a balloon with some of Earth’s air, the balloon would float. With this in mind, some engineers — including teams from both NASA and the European Space Agency — have proposed sending airships to Venus that would be sort of like the blimps we use here on Earth. And NASA’s idea, a mission plan known as HAVOC (High Altitude Venus Operational Concept), would put actual people in those airships. The ship would look and fly like a regular spaceship on the way there, but once it entered Venus’s atmosphere, it would start to inflate with compressed air that it brought along from Earth. It would be able to float at around fifty kilometers above Venus’s surface, where the temperature and atmospheric pressure are both conveniently similar to Earth’s at sea level. HAVOC’s first stage would be a robotic test mission to Venus, without any humans on board, to make sure everything goes smoothly and inflates as it should. Then, assuming the unmanned test goes as planned, a crew of two people would spend about a month being swept around the skies above Venus’s equator before detaching a smaller rocket and capsule from the airship and using them to head home. And if that goes well, we could be on our way to sending people to Venus for a whole year, or even setting up a permanent colony in our neighbor’s skies. HAVOC is still hypothetical for now — and it’ll probably stay that way for a while. But if we ever do decide to set up shop on Venus, airships would be a great way to do it. And we might not even need to develop too many brand-new technologies to make it work. So if you’ve ever wanted to live in a floating city of blimps on another planet… you might get your wish someday. Given that Venus’s upper atmosphere is a fairly hospitable destination, we think it can play a role in humanity’s future in space.